Unlimited email and push notifications. Save 15% with an annual plan. Most powerful tool for data-driven marketers ever! Pros: Vero enabled us to accelerate our business growth. Thanks to them our email marketing now makes 15% of our total revenue. There are many tools, that promise being able to do everything across all channels, but lack in just being good at one thing. Vero is a very strong tool in its space as ESP, priceworthy and I very recommend it for any data-driven business that works with newsletters or behavioral-based messaging. 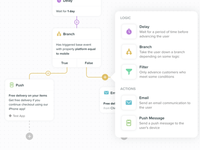 It is by far the only tool on the market that allows you in a very convienent way to pull in dynamic content to you emails with your very own API using the feature Fusion. There are no developers any longer required keeping your marketing teams independed and on a fast track. It is as powerful as any other enterprise platform, but 1000 times easier to use and you dont need any technical consultants to just make a small fix. 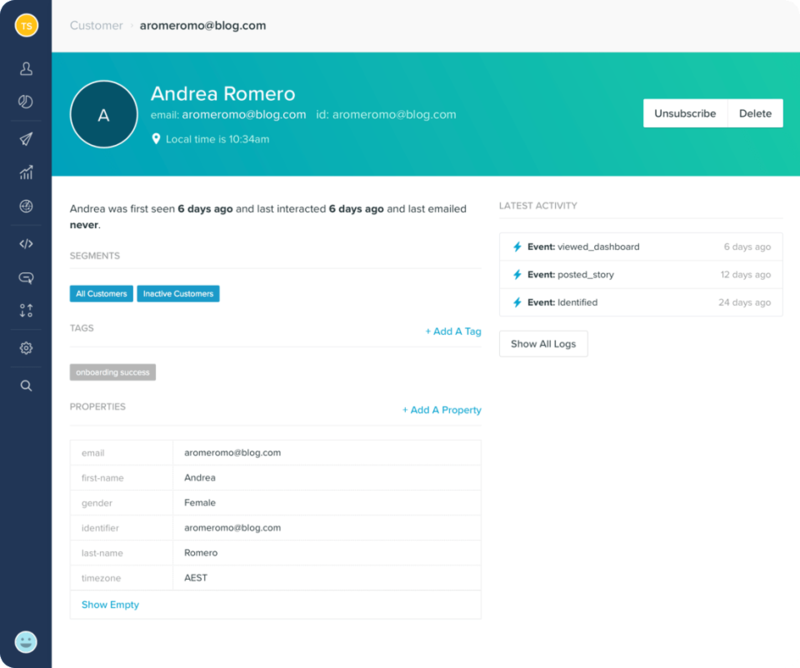 As we intgrated also with Segment we had all user activities in real time in vero allowing us to follow any user journey and improving our CRM marketing big times. Most of all we enjoy ther support teams who are with you at any time with rocket-fast response times. 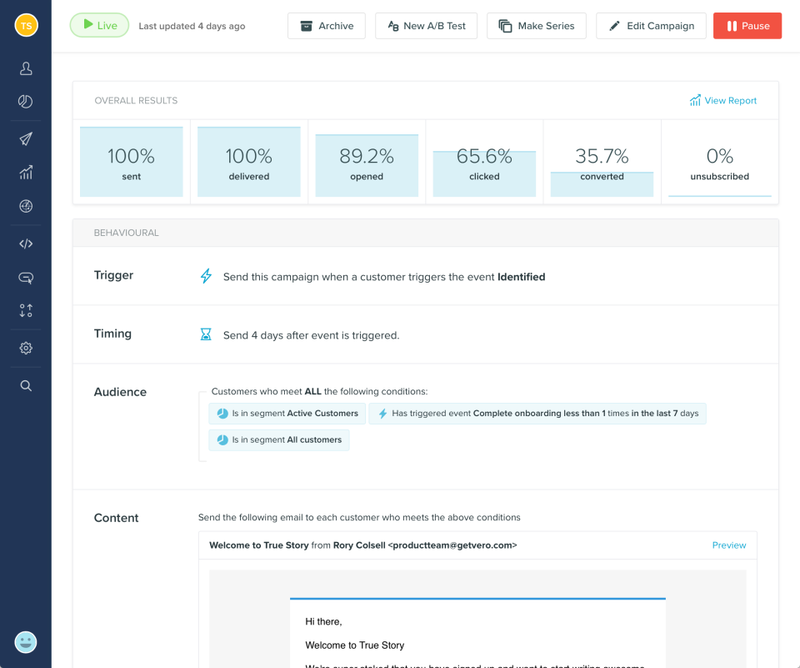 Overall: Dynamic and behavioral-based email marketing, which is easy to use even for marketers. The perfect system to send the right message, at the right time, to the right person. 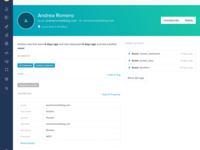 Pros: - Ability to send web, mobile and cloud events to Vero, in order to segment and send emails at a granular level dependant on customer behaviour in our products. Campaign Monitor and Mailchimp do not have this ability. - Because the system is built around 'what a customer did', segmentation based on 'who the customer is' is more limited (triggers for changes in tags, changes in field properties, when they first started existing etc). - Pre-made email templating is limited, but if you know what you're doing with HTML templates, it is of no impact. 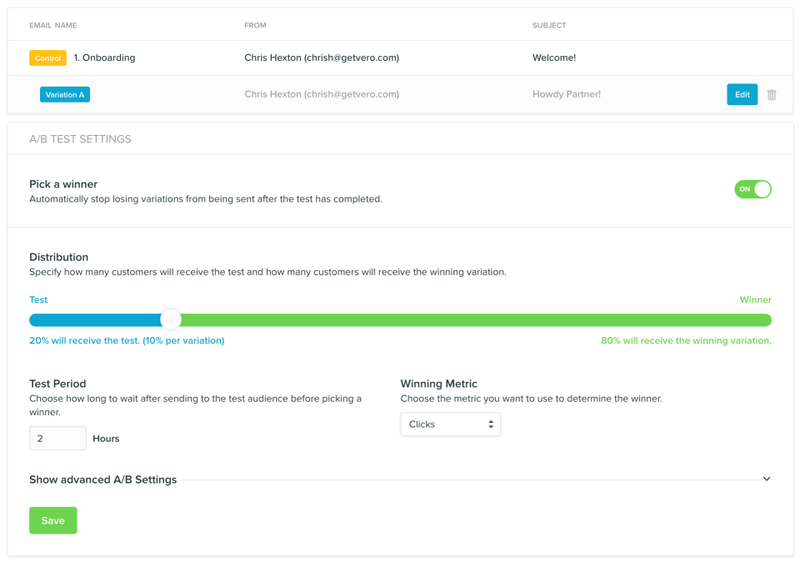 Overall: The ability to have granular control on when a customer is sent email communication. It's not based on lists, it's based on their behavior. Pros: Vero offers very good possibilities to operate at scale. It also offers an interface that makes it quite easy to get started with setting up campaigns. The way that Vero is set up helps us to deliver large amounts of multi lingual AND multi brand e-mails through the same system and production environment. Another positive thing is that Vero releases value adding updates on a frequent base, indicating that the product is developing in the right direction. Cons: Some functionalities are not 100% (mature) yet. For example if you have a large number of campaings there should be easier ways to group and keep track of hem. Also there's no solution yet for making changes to a large number of campaings that use the same template. This can cost a marketeer manual work if there are many campaings that need to be manipulated individually. Overall: We deliver millions of transactional, behavioural and newsletter e-mails a year via Vero. Even though the product is still developing it does work properly. When something happens or help is needed the Vero crew is always prepared to help out. Their staff and founder are very customer centric. Pros: Having every type of email under the same roof is a definite plus. We used to have subscriptions to several services to accomplish what we were doing in Vero. Cons: The email templates could use more love. They really need a wysiwyg interface, so that non-technical colleagues can easily design and send emails. They only currently have support for importing HTML and modifying copy. Overall: Unlike other services, Vero handles transactional emails in addition to triggered and marketing emails. This allow you to have everything under the same roof. The UI is fairly easy to navigate and the team has been adding new features regularly. The customer service is also really responsive and helpful with the founder helping us on a few occasions. Pros: This is the most versatile event-based marketing solution out there. Vero can quickly scale its data ingestion to process large volumes of data to trigger email or push notifications to customers. Cons: Only downside is that it doesn't integrate with Facebook, Twilio and other similar channels. Overall: Exceptional. The Vero team provide the most real time customer service you've ever experienced. Pros: Ease of use, right features for our business needs (fusion is great) and great valie for money! Cons: Like all tools, has occasional slowness / degraded services.. But at least it has been improving! 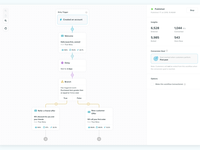 Pros: Compared against competing marketing automation tools, you will likely find Vero to be among the most affordable which often raises the question... why? Vero is a simple interface in which it is clear that UI is not at the top of the to-do list. That is not intended as an insult because you can easily navigate and find what you need, but it is not intended to visually wow. Vero works great for simple MA campaigns that do not require branching logic as you proceed through the campaign. If mid-campaign segmentation and targeting is in your campaign goals, Vero may not be the solution you are seeking. Cons: The platform's design leave something to be desired visually but it does not affect Vero's functionality. Campaign segmentation especially mid-campaign is lackluster and does not empower you to build complex or detailed campaigns. 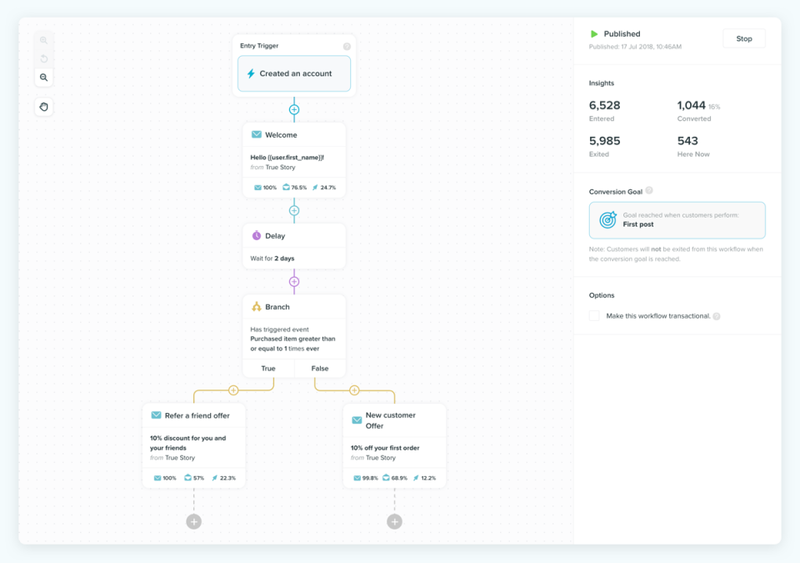 Your developer will need to connect and integrate many items prior to your marketing automation team being able to really get in and explore Vero so it requires a time investment prior to really knowing how well the solution might work for your needs. Pros: Easy and fast to understand/use. I like the way I can simply set up campaigns. Pros: When it comes down to it Vero is a really powerful platform for transactional or behavioral campaigns. While it may have a higher learning curve at the end of the day it's a key part of our business. Cons: Sometimes they have to turn the search cluster off or a little bug is found. Because it's a smaller company that is a price you pay. But it's okay and usually just a small delay. Well worth it. 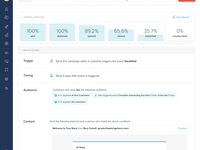 Overall: We use this for all our automated campaigns, it has helped us for marketing and sales. Pros: Has a lot of features and a clear UI. They are being transparent about what updates they will be rolling out, and are constantly trying to improve their platform. Pros: Great automation choice if you need to save money from the overpriced giants. Cons: Limited tracking and marketing data collection. Very dependent on what your development team can do with Vero and its API. Overall: If you trial Vero as a marketer, you can do almost nothing on your own. Several developers have said the API is pretty friendly but still has some limitations. First item of importance is to know Vero is not in any way a CRM nor does it claim to be. 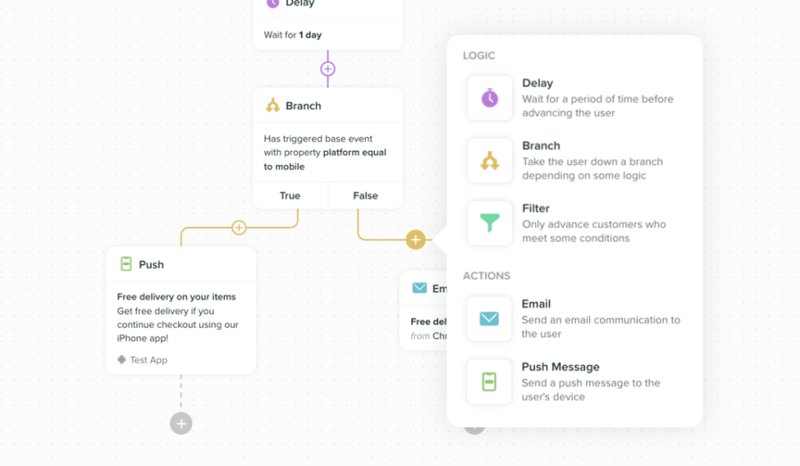 You will 100% need to connect a CRM via API. A good developer can do a lot with Vero but the interface itself is still fairly basic for your marketer. There is also limited tracking compared to some of the big marketing automation providers. Pros: Instead of focusing on a few flashy features, Vero nails it with a system of tasks you can do with email marketing. Cons: The interface is simple but sometimes too simple, it feels like the wrong tab is opened a lot. Overall: Vero finally let us use a piece of email software that we can share with multiple teams without worrying about breaking any of the moving pieces. It doesn't feel fragile yet it remains very powerful. 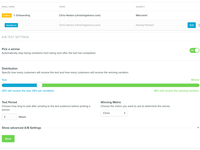 Pros: The A/B testing options are robust and pretty easy to use. The UI is clean. The software is fast, I never experienced any lag. Cons: Difficult to learn the software. Data compilation can be very complicated and difficult to configure. The templates options are limited, it would be nice to have more out-of-the-box templates. It's difficult to configure and track journey marketing emails. Overall: It's taken over a year to configure Vero correctly, to work with our data back-end and send correctly. We still have issues but when it works, it's good for testing segments. It's been a headache most of the time. Pros: Its basic functionality does work, so in the sense that it is within the lower costing solutions on the market mean that it does what it needs to. Cons: - Poor UI throughout, compared to other tools of this nature (MailChimp for example) nothing works in a manner that feels aligned with modern UI design or user expectations. - Poor performance - when you look at other modern marketing tools, having to wait for data dumps, for segments to load and be calculated (especially when they are only a few thousand in size) is crazy. Overall: It's okay, would only use if I had no alternatives.